Hello my stamping friends!! 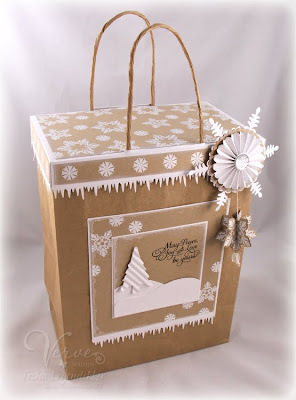 I have another fun gift bag topper to share with you. I made it in answer to the Verve Holiday Diva Dare. 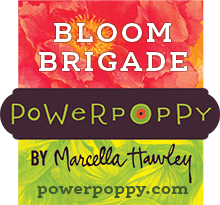 Check out my post HERE for all the details. Here's the tutorial for the topper that I made a little while back. I used the following Verve sets and dies: Glad Tidings, Frosty Flakes, Bright Spirits, Winter Fun and Snowflake Tidings. See the little snowflake ornament? That was made with the medium snowflake from the Glad Tidings set along with a new Verve die called Snowflake Tidings. And the icicles were made with a Martha Stewart Punch. 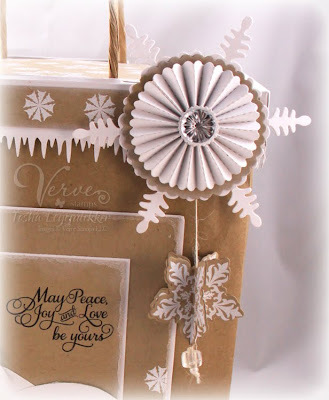 I made the medallion using the Tim Holtz Mini Paper Rosettes die along with the 2011 Snowflake Pendant and the Petite Scallop Circle dies by Spellbinders. Be sure to check out the Verve Blog for more Holiday inspiration this week. We'd love to see how you answer the Holiday Diva Dare. Gorgeous bag, Tosh!! 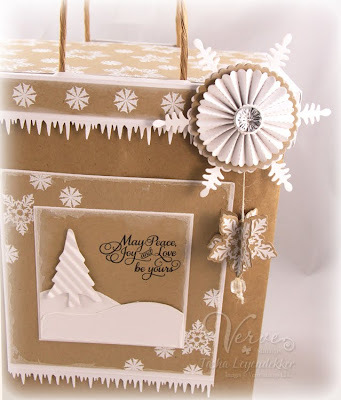 Love the white and kraft together and the crimped tree is fabulous as well as the medallion snowflake. Thanks for the link to the tutorial. Wow.this is seriously gorgeous! You do such perfect work, Tosh! Dearest Tosha!!! I love this creation! Love the verve use! What a stunning bag! I love your design and gorgeous ornament! This is a gift in itself! That bag is the perfect gift, in and of itself...so very nice, Tosh. Gorgeous, I just love kraft and white together and the layering on your snowflakes is so cool! Get out, a lidded bag?! That's too cool, Tosh! I love the kraft and cream color scheme, so rustic and warm, despite the icicles forming...hee! Your snowflake medallion is gorgeous, and I love the little matching tree! Tosha!!! Girl the bag looks adorable... I love the verve add to it..... be yours! !